Refija Husejnović and her thirty-year-old son Almir received in October 2018 an apartment in a newly-constructed RHP apartment building in the municipality of Olovo, Bosnia and Herzegovina. Refija lost her husband to the war in BiH and she has been a single mother ever since, surviving with a minimum income thanks to her deceased husband’s pension. The Husejnović family fled from the small town of Knežina in the municipality of Sokolac to the municipality of Olovo in 1992. When things got worse in Olovo due to the war, Refija had to flee and she lived in several other surrounding villages with her son – who was four years old at the time – only to return to Olovo as a refugee when the war ended. She and her son continued to live in Olovo in a one-bedroom apartment at her mother’s, together with other refugees. Refija says: “There were 20 of us refugees living at my mother’s and we would sleep on the floor lined up one next to another“. In the meantime, her son Almir graduated from secondary school in Olovo and started to work in a restaurant earlier this year. 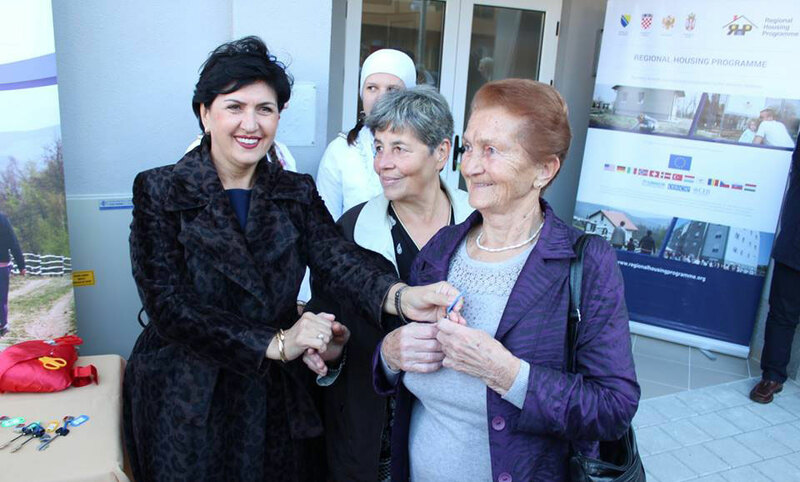 Refija learned about the Regional Housing Programme from the municipality of Olovo, which assisted her in completing the application for her new apartment. Refija and her son are very happy to have finally resolved their housing issue.